In times of tension, faith communities may find themselves vulnerable in a number of ways. Those who are visibly identifiable as members of a faith may sometimes be verbally or physically harassed or attacked. Hatred or suspicion of a particular faith may be incited. Or the cause may be mindless vandalism. In such situations there needs to be a firm response by the police, the public and the faith communities themselves. 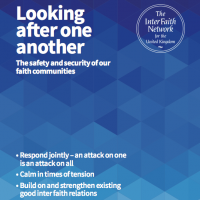 We, as faith communities, also have a role in responding to emergency situations and to inter-community tensions, both as individual communities and – very importantly – together. In our shared society we are deeply interconnected. An attack on one is an attack on all.